Calling @#%&*! 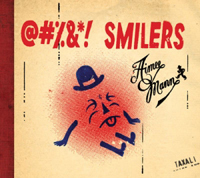 Smilers the loosest, most straightforward Aimee Mann record in a long time isn’t necessarily much of a compliment, what with the album coming as it does after a muddled, meandering Christmas collection (One More Drifter in the Snow) and an ambitious, excellent but misunderstood classic rock concept album (The Forgotten Arm), but even if it had arrived directly after Bachelor No. 2 or Lost in Space, it would still be immediately apparent to fans that this is the most low-key album she’s made in a good long while, perhaps ever. That’s good news in and of itself, as Mann’s records have, by and large, grown increasingly studied as of late, but what’s really exciting is that, mellow and laid back though it may be, Smilers also finds Mann digging in for one of her most ambitious and expansive sets yet, a record that’s warm and inviting on the surface but reveals itself to be complex and expertly crafted with each repeated spin. Of course, Mann is no dummy, despite what album titles like Whatever and I’m With Stupid may suggest, so of course she didn’t make The Forgotten Arm and Drifter without learning a few important lessons about record-making in the process. With Arm, she seems to have gotten out of her system both her guitar-pop kick and her tendency toward grand, sweeping story arcs, even as she picked up a thing or two about narrative thrust; and with Drifter, she reveled in her love for antique keyboards and lush, loungey arrangements, a trend that carries over onto Smilers, an album that’s almost totally devoid of electric guitars. The result is a shimmering, darkly mysterious album built around acoustic guitar, piano, and outdated synths, a record that moves at a leisurely pace and takes a bit longer to reveal its hooks than some of her past albums has. It’s also lacking in any narrative frame-one concept album was enough, apparently-but that doesn’t mean she’s through with storytelling; in fact, each individual song is a self-contained story in its own right, and her tendency toward psychoanalysis has thankfully been tempered by the lessons she learned with The Forgotten Arm. The songcraft is as excellent as we’ve come to expect from Mann, and even if there are no showstoppers on par with the best songs from the Magnolia soundtrack, each song is a self-contained world, generally populated with lovelorn characters seeking to fill a spiritual void by decidedly non-spiritual means. The song titles are indicative of the prevailing theme-a fruitless search (”Looking for Nothing”) for something intangible (”The Great Beyond”) with time running out (”Borrowing Time”). Naturally, it’s not an especially cheerful record-the title is appropriately bitter-and the tendency toward slower, more reflective songs means that the album can come across as a bit dour at times, especially at thirteen songs long. Cutting a couple of tracks, or including another song or two with the energy of the synth-and-horn-driven stomper “Borrowing Time,” might have made it a more focused and powerful record, but even with some minor flaws, it’s remarkably effective. Of course, it’s still another left turn in a career that’s been filled with them recently, and some fans are likely to find the album’s deliberate pace a step down from hookier records like Bachelor No. 2. Regardless, the excellent songwriting and production speak for themselves, and the album-dark, complicated, and ultimately very rich-is a rewarding listen that pays back whatever the listener is willing to put into it.